Warm up for the season: Down puffer from Land’s End, American Eagle Outfitters cord jeggings for the urban ski bunny. Michelle Mawby, a Toronto interior designer, has an eye for finding on-trend items for her clients, her home and her wardrobe. She has a shoe habit, some might say, with about 400 shoes, not that there’s anything wrong with that. In this monthly series, Mawby shops — online, in her neighbourhood and around the world — and shares her top picks. Never one to be shopped out, my early January shopping goal is to get the trendy “après ski on the street” look down perfectly, while taking advantage of amazing pricing and getting everything on sale. The first piece I acquired is a fur trapper’s hat. Waking up to negative temperatures in the double digits, I’m going for real fur and not making any excuses — I cherry-picked this white rabbit trapper hat both for its warmth and its cuteness. It will keep my head warm while showing off my pink cheeks (not from blush but from the cold) and it’s on sale for $34.95 straight from Manitoba. I also love that I can put the ear flaps up to give it a more formal look for evening. To go with my charming new hat, I need a truly warm jacket. Having lived in Ontario for the past 10 years, I’ve learned that down is always the best way to go for its light weight and insulation. 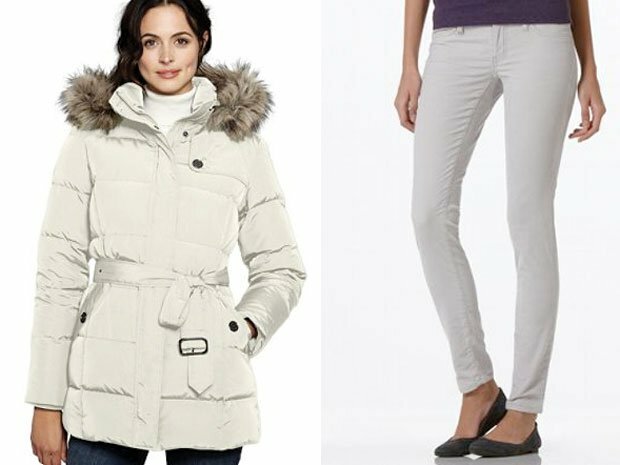 This down puffer from Land’s End ($119) is flattering, a perfect winter white and yes, on sale. I chose the longer length so it would be even cosier this cold January. With the removable hood and classic neutral colour, it is also more sophisticated than your typical down jacket. With Conan O’Brien popularizing jeggings even more than a high school cheerleading team, I’m adding a cord pair in Cool Grey from American Eagle ($34.95) to this urban ski bunny look. The cord material will help keep me warm and adds texture to the look. To keep my neck protected, I’m delving into the knitting craze and trying Wool and the Gang’s knit your own Snood Dogg circular scarf in dark grey. It’s on sale for ￡40 at Brownsfashion.com. The kit includes wool, knitting needles and, most importantly, easy to follow instructions. I love a snood and can boast I knit it myself (although I may have to coax my mom into finishing it for me). Of course, new boots finish the look. While I already own a lot of winter boots (a necessity in Canadian winter), I couldn’t resist Pajar’s tall Luv Boots in grey at Ron White, on sale for $129.99. Canadian-made since the 1960s, they are stylish but sturdy and will look great with tucked-in jeans or leggings. They are waterproof and claim they are comfortably warm down to -74 degrees C but hopefully I won’t have to test that claim. Who knew a practical pair of boots could look so good?